The International Space Station’s seventh crewmember, a dextrous humanoid robot called Robonaut 2, was powered up for testing yesterday. ESA astronaut André Kuipers assisted ISS Commander Dan Burbank with the assembly and power up of Robonaut. Together with ground controllers, Burbank tested Robonaut’s joints and force sensors before stowing the robot for more testing today. 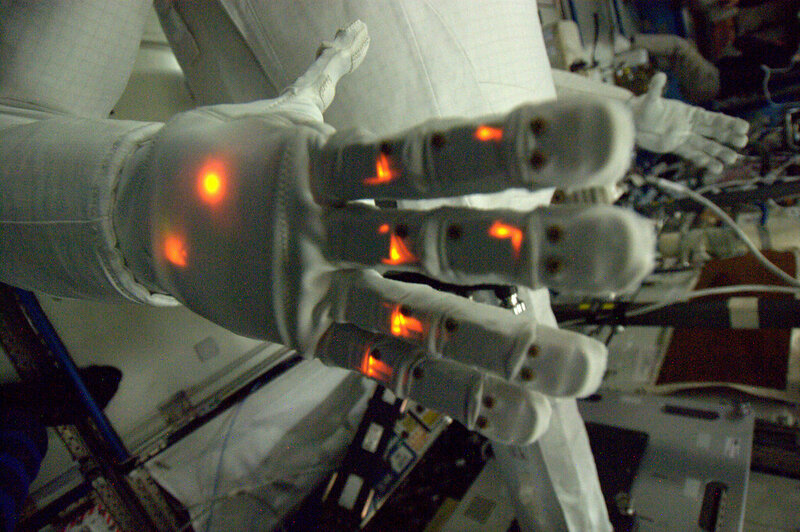 NASA’s Robonaut is in a demonstration phase, but eventually robots could relieve crew of tasks which are fairly repetitive and can be automated. Crew time on the ISS is an extremely scare resource, freeing up some of their time spent on simple tasks would mean more time for those tasks that require human skills and reasoning. Another advantage of robots is that they can move with extremely low acceleration – crew activity within a Station laboratory can disrupt the environment when an experiment is being conducted. Robots could one day venture outside the Station to help spacewalkers make repairs or additions to the Station or perform scientific work. Within ESA there are also several robotics projects lead by the Automation and Robotics group. They are working on projects such as the EUROBOT testbed for use in low Earth orbit – for the building and operating the International Space Station, and other technologies for the exploration of the Solar System, such as rovers for the Moon, Mars, asteroids and comets.